At Green Hills Child, your young student will not fade into the background. A Pre-K or Kindergarten class in one of Nashville’s leading public or private schools may have up to twenty students per class, as many as 100 other children in that grade, and two or three hundred older children enrolled at that school. A Kindergartener will be among the youngest children enrolled. Kindergarten is our oldest age group. * And with room for just 26 Pre-K and Kindergarten children in our two oldest classes (we serve infants through K), your child will benefit from dynamics not available at a standard elementary school. We have placement for just six Kindergarten students, who are senior in the class to eight other children who are advanced Pre-K students. Each child learns on a Kindergarten level, adjusted according to their cognitive ability. 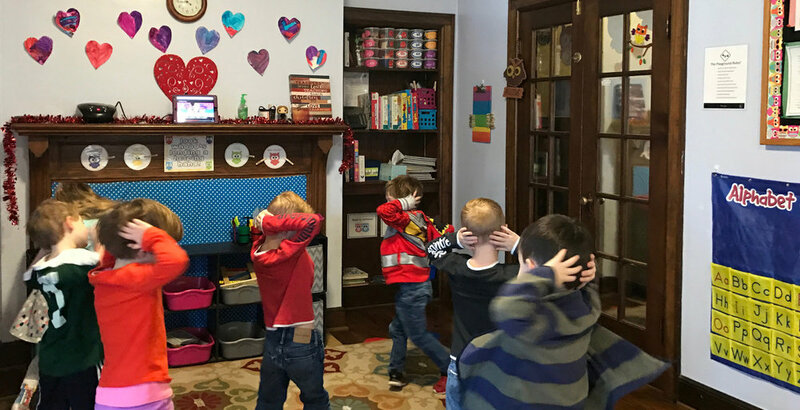 This mix of older (K) and younger (Pre-K) children in a smaller group size lends itself to more one-on-one time with the teacher, more opportunities to develop emotional & social self-confidence, and more opportunities to lead in an organic way among their friends. * Our Pre-K class is our second oldest, and consists of no more than twelve students, usually younger four-year-olds. With twelve, sixteen or perhaps nineteen or more years of formal education ahead, a year at Green Hills Child might make an important difference. If you’re concerned that your child may get overwhelmed or “lost in the crowd” during the first year of elementary school, schedule a tour to see if the advantages here could help form a stronger social and academic foundation. Taking on the larger educational context doesn’t have to begin too soon.